Seven outdoor meeting areas are located in quiet areas around the site. Up to twelve guests can be seated comfortably while enjoying the outdoors. The beach volleyball court offers team challenges and coordination or just the fun of building sandcastles. Our large grassed area can be used for group games and activities needing space and the ability to run off some energy. The Shearing Shed is an original building that was shifted to the Warrambui site in the late 1980’s. The shearing shed seats up to 60 adults and is used for a variety of activities. Two basketball courts are available for any hard court games. The courts are set up for either basketball or netball. Many groups have fond memories of sitting around the fire, singing along to songs lead by our Interns and staff. You are welcome to cook marshmallows and damper in the non-fire season. 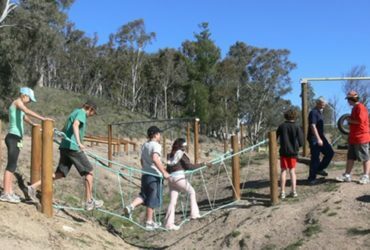 Warrambui has a range of outdoor programs run by our staff. Click here for more information on the programs we can host for your group. Our bush walks offer a great way to explore some of the beauty of Warrambui. There are maps available for the two main walking trails.